This guide will describe how to force your video card to run at max voltage & curve overclock using msi afterburner. This guide will be useful to geforce gtx 10 series users as well as future geforce gtx series graphic card users. #1 Download & install a copy of msi afterburner. Download the latest version. #2 Set gpu fans manually to 100% to keep the graphics card cool. We are going to be pushing the gpu to max voltage & overclocking so using 100% fan makes perfect since here. 2a: If you own an evga video card that includes 9 thermal sensors you'll need to download a copy of evga precision xoc, and use precision xoc to set all your fans to 100% before using msi afterburner to force max voltage/overclock. See figure 1. 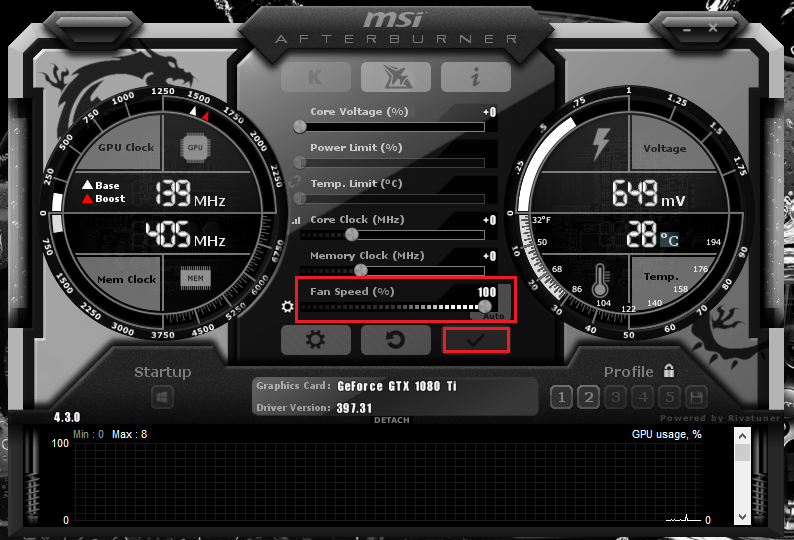 2b: If you own a non-evga video card, or a video card that doesn't support asynchronous fan control you can use msi afterburner to set your gpu fans to 100% without having to download precision xoc. See figure 2. #3 Open msi afterburner, set core voltage, power limit, and temp limit to their max values. Don't forget to click the check mark button to apply your changes after increasing all settings to their max values. #4 Press CTRL+F while msi afterburner is open to open the voltage/frequency curve editor. 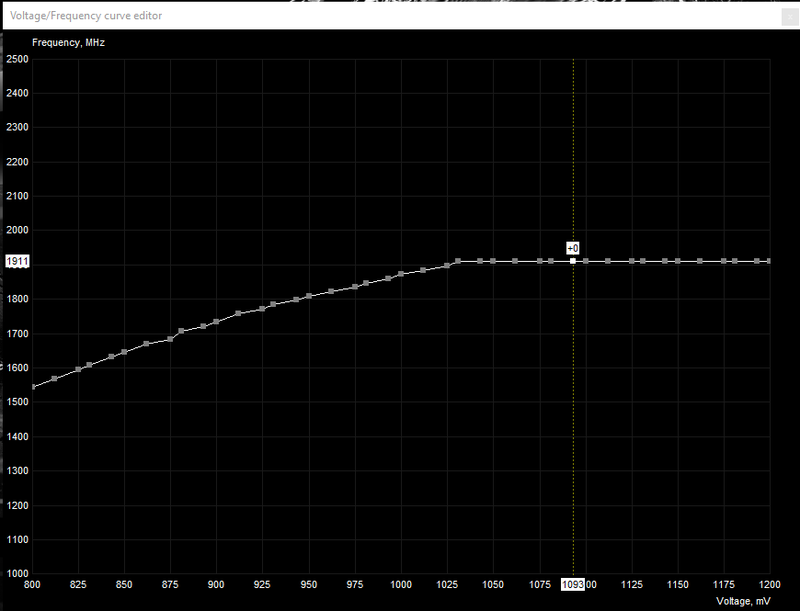 #5 Select a point on the curve that corresponds to your cards max known allowable voltage. I own a 1080 ti, so I'll be selecting a point on the curve that matches 1093mv. See figure 3. 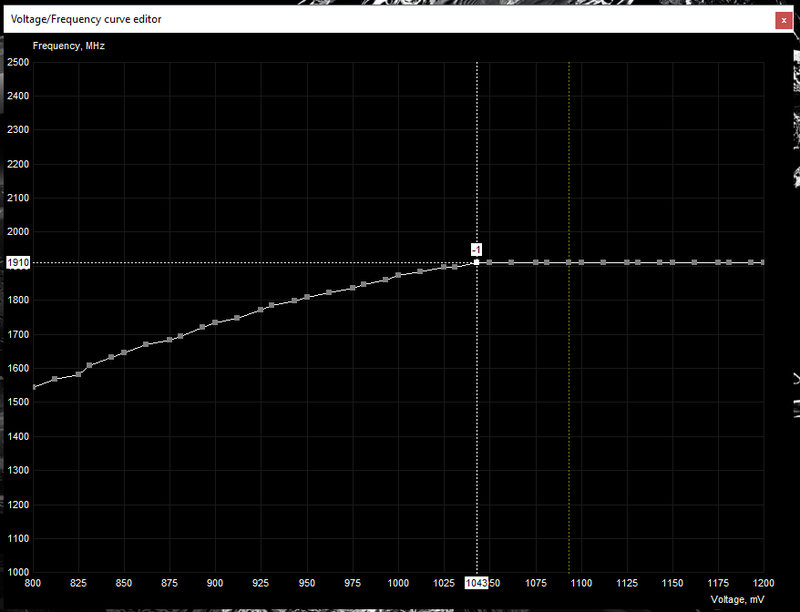 #6 Press CTRL+L right after selecting your voltage/frequency point on the curve. You should see a yellow dotted line pop up on the curve editor. See figure 4. #7 Press the check mark button on the main gui to apply your changes. 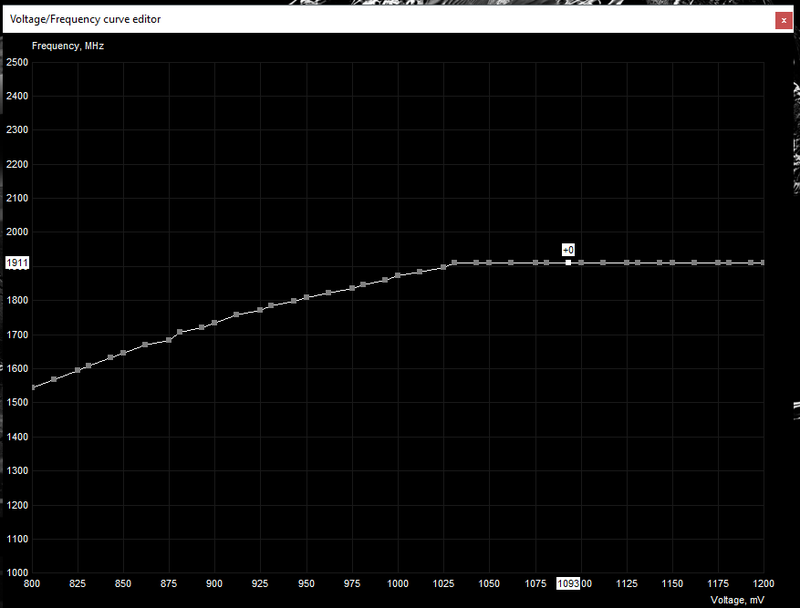 Your card should now be running at a fixed frequency/voltage, and your curve should look like figure 5. #8 Inside the voltage/frequency curve editor select the point on the curve where the vertical white line is, and press the down arrow key on your keyboard to make the value read as -1. See figure 6. #9 Press the check mark button on the main gui to apply your changes. Your card should now have jumped to the next voltage/frequency point on the curve, and should be running a higher voltage. See figure 7. #10 Repeat steps #8 & #9 until your white & yellow vertical line on the curve combine as one, and you see nothing but the yellow line anymore. See figure 8. #11 Now time to apply some faster clock speeds with the fixed voltage. Go back to the curve and select the point where the yellow line is, hold CTRL on your keyboard and drag the point upward until you're at a frequency you'd like to run. #12 Press the check mark button on the main gui to apply your changes. Your card should now be running at max voltage with an overclock. See figure 9. Figure 1: All gpu fan sliders should be set to max. Don't forget to click the apply button to apply your changes after increasing the fan sliders to max. Close precision xoc. 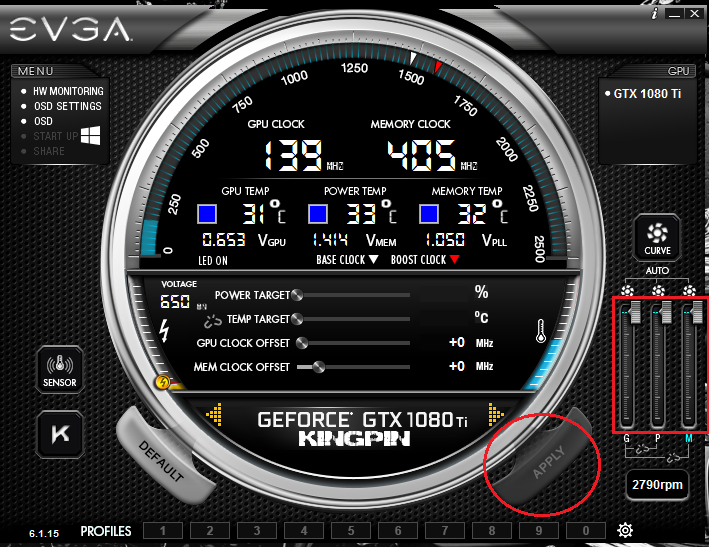 Figure 2: Set the gpu fan speed slider to 100%. Don't forget to click the check mark button to apply your changes after increasing the fan speed slider to 100%. Figure 5: As you can see my card is running at 1911/5508 with a voltage of 1042mv. My power limit & temp target are grayed out because I'm running a special vbios on my 1080 ti kingpin. Your settings should be at max values at this point. Figure 7: Notice how the card is now running at the same 1911/5508 clocks, but with a higher voltage of 1049mv. Figure 8: Notice how the card is now running at the same 1911/5508 clocks, but with a higher voltage of 1093mv. Figure 9: Time to go run some benchmarks! #1 Open settings, and on the general menu select unlock voltage control. 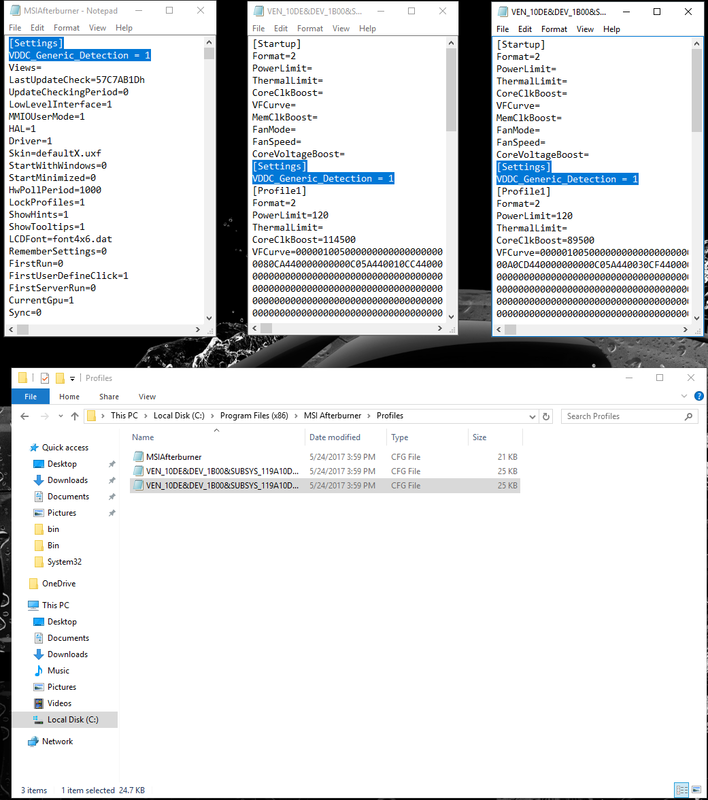 #3 Open all .cfg files inside the profiles folder with notepad. #4 Look for [settings] section inside all the .cfg files. If no [settings] section exist create one. #5 Add/change vddc_generic_detection to 1 under the [settings] section. #6 Save and close all .cfg files after making changes. #7 Start afterburner. Should be able to adjust the voltage now. just revieved the gtx 1050 ti ftw. played world of tanks max graphic settings with evga oem settings, and notice one stutter after a couple hours. then ran unigine valley and there was a lot of stuttering. from what i have been reading online this card is built to conserve power and seems to need more power. installed afterburner today for two reasons wanted to monitor cpu and gpu temps with one program, couldn't find cpu temp in latest version of precision x. also wanted to set a fan curve because it seemed to run a little hot for oem settings. does this force the card to run at max voltage when at idle? how do i find max known allowable voltage? Second question: Yes, but only if you leave CTRL+L applied. Third question: Set the core voltage slider to 100% inside afterburner then click the check mark button on the main gui to apply your changes. Now open the voltage/frequecny curve editor and follow steps #5 through #10. When performing step #5 select the 1200mv point instead. Now do the rest of the steps as instructed, and take note how high your voltage goes until it resets to a lower value. The last highest voltage reading given by afterburner is your max allowed voltage. not sure which would be the max. i clicked the 1200 square and hit ctrl+l that took the white line to 1112 the gui read 1111. followed the steps and the next square was 1093 and the gui read 1093. the next square was 1100 and the gui read 1100. the next square was 1200 it was still at -1 and the gui read 1111.
i did see some where earlier all pascal cards are 1093 max. What happened at 1125, 1131, 1143, etc? the line never went to those squares. the two lines never joined together. the line ended up on the 1112 square and it was already -1 the apply button was not available. Ok. Your max allowable voltage is 1112mv. poster above is correct 1112mv. Very useful, and very clear too. Thanks, Saijin. Love the guide. Simply posting here to save the thread! A fantastic guide Sajin and it has helped me OC more than I could before. The only difference is my EVGA 980 ti superclocked + ACX 2.0+ which is watercooled by a hg10 n980. I would be forever grateful if you could create a fitting bios for this specific GPU or just answer some of my questions. Thank you so much and have a good day! 650w is plenty for that system. What exactly do you want the modded vbios to do? Hello thanks for the fast reply! I honestly don't know much about modding bios. But a higher voltage and power limit would be nice, especially since its watercooled and can maintain a low temperature. Trying to unlock additional voltage via the vbios will cause the card to throw a code 43 error in the device manager due to recent changes nvidia has made to their drivers, so trying to unlock additional voltage isn't going to work. Power limit change should work. Nice!! :) I would be extremely thankful if you could help me with that! like seriously, it would be very nice of you! yeah also, this is going to disable the gpu boost right? Yeah, I can disable the boost.